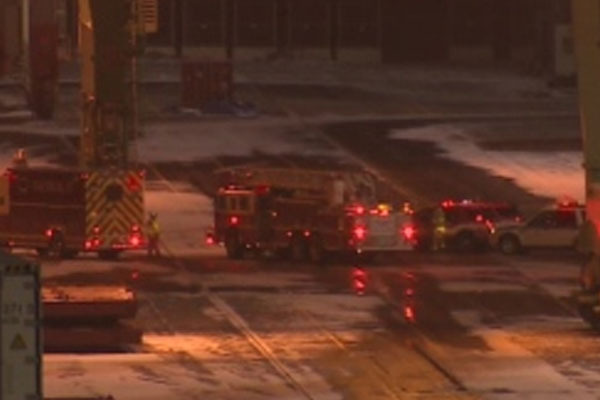 (CNN) — There has been no leak of radioactive material after large containers holding it fell on a transport ship at a port in Halifax, Nova Scotia, a local fire department spokesman said Friday. There were also no injuries and no contamination in the incident, which occurred Thursday, said spokesman Phil McNulty. Hazmat crews inspected the ship for hours before determining that the containers had not been breached, CNN affiliate CTV reported. People working on the site were also cleared of exposure to radiation and sent home. A rack used to transport four radioactive containers fell back onto the ship while they were being offloaded, fire spokesman Steven Martyn said. An emergency response team from Toronto is on its way to Halifax. Initially, a fire official reported radiation had been detected.